We are grateful for another year of learning, growing, loving, and living life one day at a time. We are so appreciative of family and friends, sharing music with others and the encouragement and wisdom the Lord provides everyday. We are also grateful as parents for all the places our children lead us to! This year Rebecca and Ryan brought us to new heights. Rebecca led us to NYC in February (Brrrrr!). She again was invited to sing with the North American High School Honors Choir performing at Carnegie Hall. This time she traveled there by herself. As parents we watched the plane disappear into the dark rain clouds early that cold Feb morning in Burbank. It was a stretch for all of us. We flew to NYC ourselves a few days later. During Rebecca's last rehearsal, Kelly and I took a long walk through a cold and snowy Central Park. The 4 hour jaunt was a memory all its own, a wonderful addition to the beautiful heavenly music in Carnegie Hall. 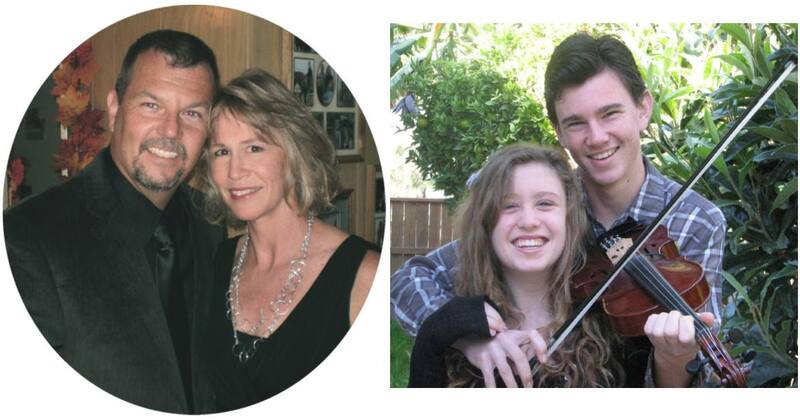 At 18, Rebecca continues college coursework while a Senior at AGHS. This Fall she performed with AGHS Choir, and Christmas Village Carolers, taking a break only to get her Wisdom teeth removed. She became a Finalist in the National Classical Singer competition last Spring and had the opportunity to speak with many college reps. (See You Tube - Rebecca McKinley - to view audition.) She is undecided about a major but is fascinated with Vocal Science. She will be flying back to sing in NYC again Feb 2012 and then work with San Luis Obispo Opera in Spring. Passing by the opportunity to graduate early, she'll continue with the AGHS Choir and ROP Computer Service Tech Program this Spring. She enjoys time with friends, reading, and learning new music. She was recently honored to sing the National Anthem at the homecoming of a young wounded USM Corporal returning from the Middle East. It was touching!! Ryan,15 years old (& 8” taller in 14 mo) is a Freshman at AGHS. He continues to revel in “Airsoft!” If you've heard of it, I don't have to tell you much about it. If you haven't, here goes: mix some plastic BB's with authentic replica's of military weapons, military fatigues, 40 acres of wilderness, an entire day to play, and you've got a recipe for an Airsoft Operation! Ryan is generous with his arsenal, creative in his leadership, a gifted sniper, and captivated by inspiring moments that seem to characterize every game. Dinnertime is often laced with battlefield stories! At times, its feels like we're running a military base; the yard - full of gear and troops loading in and out of the 'Ol Suburban. Strangely, driving such an equipped crew makes one feel rather safe on the road. The big Airsoft event this year was “New Horizon” in Sylmar, S. Calif with simulated military combat with 150 participants, and leaders such as a Soviet Sergeant Major who fought in the Soviet/Afgan conflict. Kelly, often finds himself to be more than just a chaperone.. and is reminded it's not as easy to run through the forest playing army games as it used to be!! As a Freshman, Ryan's athletic ability heightened with intensive Cross Country workouts. He's also interested in Volleyball and golf. Though starting HS has had its rough edges, Ryan enjoys and excels in Engineering and CAD classes. The year brought bountiful increase of Bluegrass into our home....Forget '”Rap” or anything else that's “in” at HS. Ryan is paving his own road and taking his dad with him! 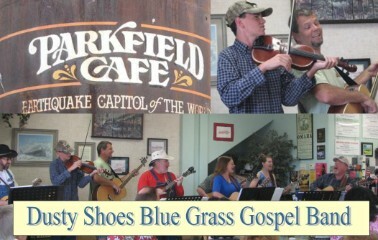 Ryan plays his fiddle/violin every Saturday with the Dusty Shoes Bluegrass Gospel band at Station Grill. He loves to jam at SLO Pub, assist at Community Events with the band, and is rapidly improving on his Banjo on the side. 2012 to our Friends & Family! A highlight this year was attending the Parkfield Bluegrass Festival in May and jamming with the bands around the clock. Ryan continues Classical training as he branches out in Bluegrass. Kelly and Ryan recently took a few other Central Coast Bluegrass Society members to see Earl Scruggs in Concert at UCLA. Yee-haw!! They have a lot of fun together! While in Las Vegas to see Phantom of the Opera for Rebecca's 18th birthday in August, Ryan had the golden opportunity to experience a shooting range Nevada style! 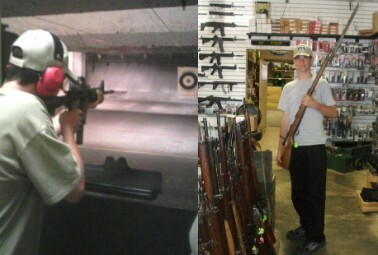 Ryan tried out an MP5, M16, Thompson Sub-machine gun, and an MP40. Apparently his good aim caught the attention of the staff....'where does this good shootin' come from.. is it tied in with the Bluegrass???? We'll never know! In April we picked up a motorhome that met Kelly's criteria; a low mileage, mechanically sound rig that needed updating to the new millennium. By some miracle it was ready for our annual Summer Hume Lake camping trip with friends and family!! Our motorhome was roomy and warm. I admit...better than our little trailer. A week of swimming, kayaking, sailing, volleyball, biking, hiking, Ultimate, Disk Golf, great food, the smell of pine, Bluegrass music by the fire, and great friends everywhere, made this trip a step away from heaven! Kelly continues his work as the Structures Maintenance Engineer at Cal Trans in San Luis Obispo. He continues his hobby of restoring...anything...especially his 510 Wagon. He is so patient... with a little 4 inch roller and thinned Rustoleum....he rolled 12 coats of paint on that little car and called it fun! (See Internet for “$50 Paint Job”)!!!! I guess it was just preparing him for the motorhome makeover (see our Website video!!) 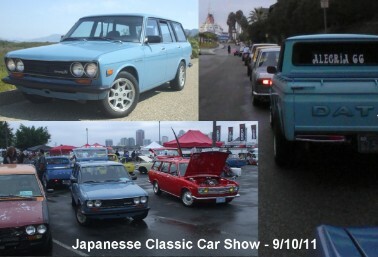 In Sept, Ryan and Kelly entered the Datsun 510 wagon (“MiniMe”) in the Japanese Classic Car Show in Long Beach at the Queen Mary. Over 400 old school Japanese cars dating from the 1930's to the early 70's. Quite an eclectic mix. LISA: I still work as a part-time academic counselor at Allan Hancock College. On my B-day Rebecca surprised me with a special visit!! Cold and wet from the rain, she came in with gifts and said no one should be without flowers and cookies on their B-day! It also marked 21 yrs @ AHC...gee, I wonder what I'm going to do when I grow up...speaking of, Kelly and I continue to play Ultimate (Frisbee Football) a few times a week. It keeps us feeling young and involved in an active community of athletes. It's truly our recess! Recently, Kelly and I attended our 30 Camarillo High School Reunion in October. Kelly laughed when I said, “Oh look, they invited some of our instructors,” then realized ”they” were some of us! In November, we visited Coleen (Abangan) Garcia and her precious family in Redding. Rebecca, Ryan & Kelly had the opportunity to perform at their Restaurant GrillaBites... Redding will never be the same. On the way home we stopped in San Francisco and visited special friends from the TS Society. It was a short, rainy trip, but it was wonderful to see friends! It truly has been a full and rewarding year! We hope you all had a wonderful Christmas! Know that it is the Lord who sustains and blesses you. Feel free to drop by or call anytime!...Find Kelly on Facebook!